One area of your home that is often neglected is your garage; it is the first place items you don’t want, will get dumped. How to get your garage organized is a difficult process but it is going to take time; if you want to get it right you might need to spend some time planning the best layout for your family and your current needs. This is one reason why it is important for any system you choose is flexible to allow a change in the future as your needs change. If you are looking to get your garage organized then you need to decide what’s being stored there, often this is where the problems lies. It is the first place that many people put the items they no longer need or want and it is the ideal storage spot for those larger items, including children’s summer toys, as well as the obvious space for any cycles that you own. This might sound like the most obvious place to start but it is surprising how much stuff is left in the garage rather than just being thrown away. I know that if something arrives during the week I need to store the packaging until I am able to get to the local waste recycling center at the weekend. However, I know that it is easy to forget this rubbish and it can sit there for weeks. Have a designated spot for items that need taking to the recycling center, this makes it easier to spot what needs recycling and what is part of the storage for the garage. Having this spot will help when you come to sorting out the other items in your garage, you will know where to put the rubbish and the items that you wish to recycle or donate to local charities. It is important that you assess the items in your garage, what you want to store in there and the practical issues that you face getting the storage system which works for your current needs. Having a plan for what you will store in your garage will help you decide how items will need storing to make sure they are safe and stored correctly. If you want to get your garage organized, you need to give yourself time, it isn’t an easy job and you will find that you need to allow plenty of time to get the organization project complete. You might not even complete the whole task in one day; it is possible that it takes a few weeks to get right. The more time you are able to give a project the easier it is to complete properly. A rushed organizing task will look rushed; it will have the tell-tale signs of lack of planning and poor organizing. It is better to take your time over a project and get it right first time-saving you money and frustration further down the line when you are re-doing the same project again. The most important tool is the ability to label; yes, the pretty ones look nice, but even some tape and a permanent marker will do the job. Sometimes until you have the items in place, tape can help you to change your mind and move a category without causing too much chaos. If you are using storage boxes it is important to have a list of the items it contains, this will prevent the need from opening every box looking for an item. You have a choice here, you can record this information directly onto the box or you can code the box and have a record of the box contents held in a file. This allows you to look for items without climbing around your garage looking and reading labels until you find the right box. One area that I must mention, for some reason round storage containers are popular, for me they cause more problems. Round storage containers are not good at sharing the space on a shelf, they tend to leave wasted space. I find this annoying, and one reason why I don’t buy storage options which are round. My husband loves those pegboards to organize tools on and he is then able to tidy up knowing what is missing by the open spaces. They are great for keeping things organized and accessible too! It is not easy when it comes to making those hard choices when you need to throw something away or donate it to a local charity shop. Remember, that memories are held in your heart and not in material items, they might remind you of a certain time but they aren’t the keeper of those memories. Often, many people in the home store items in the garage and whilst it might be easier to personally tackle all the areas, it is important to get input from the other people in your home as to what they want to keep and how to get the area organized. It isn’t an area that I would tackle on my own and I certainly wouldn’t move my husband’s tools without his knowledge first. It is more difficult to organize a space that you don’t love or haven’t built that bond with. If you use it for a dumping ground it is going to cause you stress at the thought of trying to get it straight. However, the process of organizing will help to create that bond and it will make you want to keep your garage organized and tidy. Therefore, if you are looking for ways to get your garage organized it is important to plan the area, to separate into the different categories and to take your time with the organizing and the sorting of the items. Don’t rush this organization project or you will only have to start again! What is your favourite tip to get your garage organized? If you are looking for more information on this topic head over to the landing page where you will find links to other articles on organizing your home. 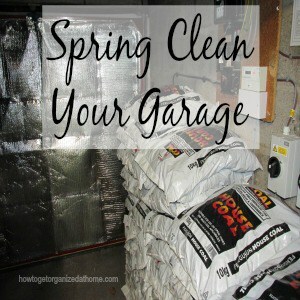 If you are looking to Spring Clean Your Garage this week then check out this article too!